300K PRICE REDUCTION â 4/2/19; NO HAGGLE / PRICED TO SELLâ¦. 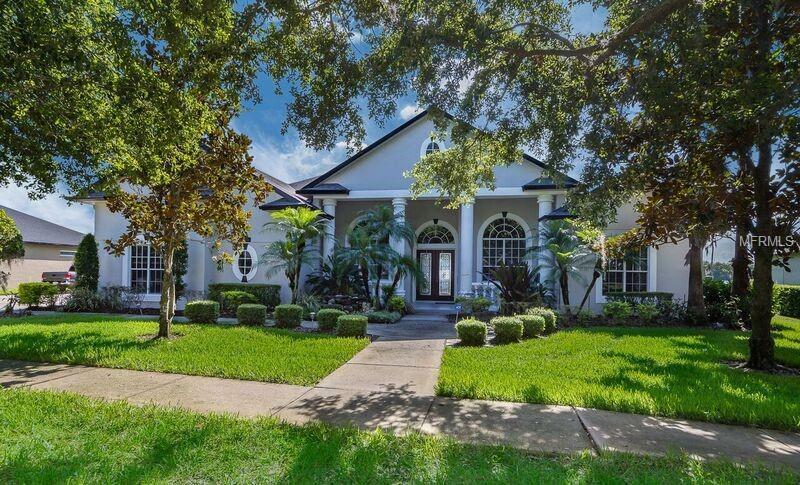 SPECTACULAR LAKEFRONT CUSTOM HOME IN THE HEART OF OVIEDO! 5/4.5 PLUS IMMENSE bonus room! BREATHTAKING SUNRISES LOCATED IN KIGSBRIDGE WEST SIDE OF LONG LAKE, an awesome SKI LAKE! Custom features GALORE! IF YOUâRE LOOKING FOR ONE OF THE BEST HOMES, ONE OF THE BEST LOCATIONS, YOUâVE FOUND IT!!! UPSCALE features include structured wiring throughout with video security system, 3 A/C units, central vacuum, mature landscaping & lake fed irrigation. Gourmet kitchen with 42" cabinets and stone countertops, custom fit appliances, convenient island, breakfast bar, family room with COZY gas fireplace & detailed built-ins. French doors access a huge patio area & sparkling custom pool built by the best ~ Bruce Wemple with all the details. Eye popping views of Long Lake from nearly every room with new hand scratched wood flooring throughout 1st floor! SOOTHING master suite w/bay window, double 12' X 5' fixed glass doors leading out to an INCREDIBLE LANAI and outdoor kitchen, POOL & LAKE! SUMPTUOUS master bath complete w/walk-in glass block shower, dual sinks & jetted tub! Outdoor lanai features multiple ceiling fans, refrigerator, wet bar, gas grill, outside shower, wired for sound plus TV. Pool with spa, & custom water feature. Dock/boat house w/boat slip & hoist, water/electricity available on covered & open deck. Oversized 2 car side entry garage, 3rd pass though garage w/12' X 10' high roll-up doors for boat/RV. NEW ROOF, RARE FIND!! !